Planning my living room makeover and a peek at the progress so far! There’s one zone of my house I’ve never managed to get quite right — our living room! 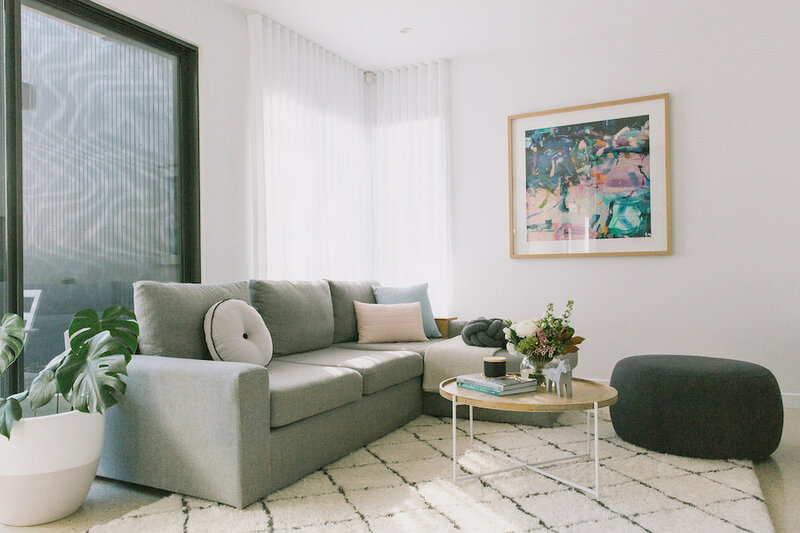 When we first moved in, my old brown furniture totally clashed with the contemporary feel of our new home and in a desperate attempt to ‘fix’ it quickly, I bought the first pieces of furniture I could find and afford. 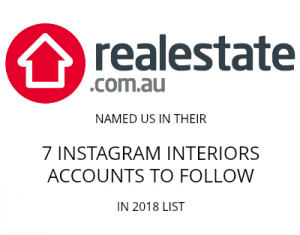 There’s a reason I always go on about the importance of doing a mood board and getting your ideas on paper before going out shopping — it allows you to see, edit and curate your ideas until you’re happy with them before making any financial commitments you may come to regret. After more than a few wrong moves in this space, I decided I would finally listen to my own advice and create a mood board. 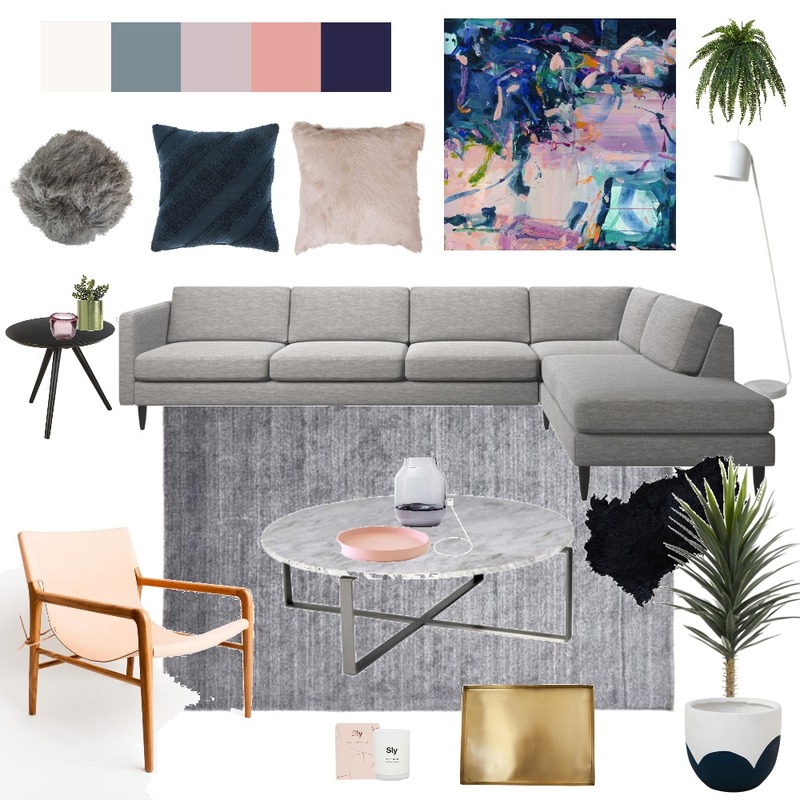 Here is my vision for our living room (I created this mood board using my favourite free online tool Style Sourcebook). Before I explain too much about the mood board, I thought I’d quickly remind you what my living room looked like before (see pics below). Since moving in, I changed our brown rug to a round jute rug (which wasn’t a good fit and far too small) to the Kenza rug from Freedom (shown below). This rug was on my wish list forever so I finally bought it last year but it’s not practical when you have a black dog and this rug sheds a lot so I’ll be moving it into one of the bedrooms. I got rid of our chocolate brown leather sofas and bought this L-shaped sofa from Fantastic Furniture instead. At the time, I didn’t have a big budget to work with and as I was just about to have Patrick, I didn’t think it would be wise to invest in an expensive sofa that could get ruined by young children. Turns out Patrick hasn’t really damaged anything yet (fingers crossed it stays that way) so I’m more comfortable with having higher value pieces in the home. While this sofa is fine, it isn’t large enough when we have the whole family over and I want to achieve a living room that feels more luxe. I’ve always had a BoConcept sofa on my wish list and I’m so excited to have ordered the one on the mood board above. 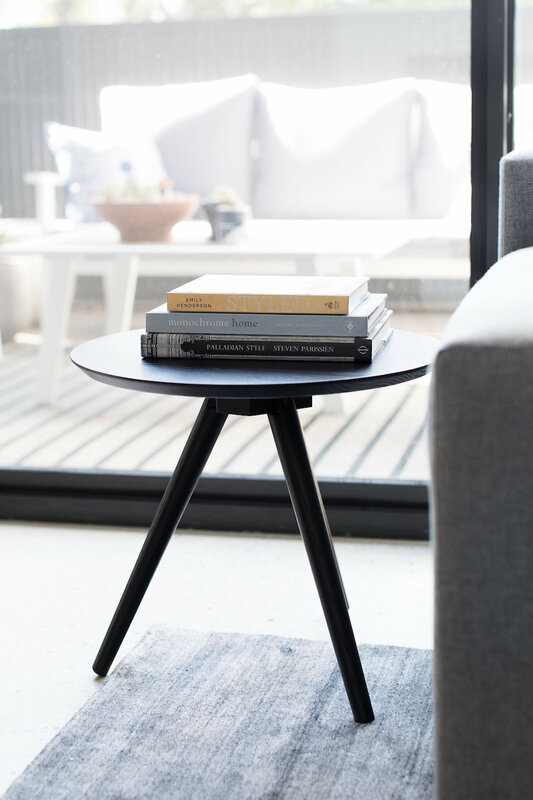 Our coffee table is another piece that’s gone through a few iterations. First we had a glass and timber coffee table, and then I changed it to the timber and metal leg table you see below. I absolutely love this coffee table but the timber stain clashes with other timber in this space so I had a piece of marble cut to size and simply replaced the top. In an effort to have more seating in here, I also bought that round ottoman from Freedom but I don’t feel like the size/scale of it works so I’ll be changing that too. One of the first decisions I knew I had to get right in here is the rug. It accounts for such a large surface area and after getting it wrong so many times, I wasn’t prepared to do it again. For practicality reasons, I knew I needed a dark grey or black rug and was so happy when I found this Manhattan rug from Rugs of Beauty. Since changing the rug our living room already feels SO MUCH BETTER! 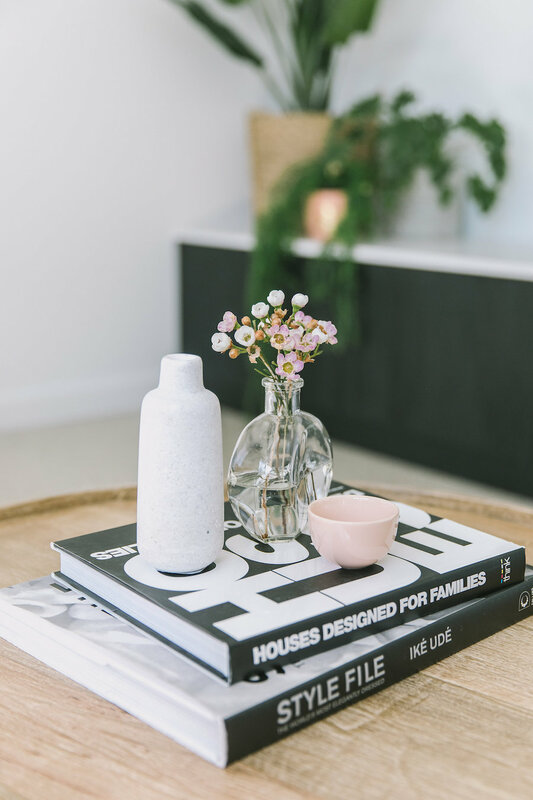 Replacing the coffee table top to marble has also been an absolute winner and makes the space feel more sophisticated and luxe. I took the ottoman out of here and moved the pot plant to the corner to make way for a new black side table from Zanui. I love the look of this table and it’s also much more practical. Another change is getting a much-needed floor lamp so I’m not just relying on downlights. 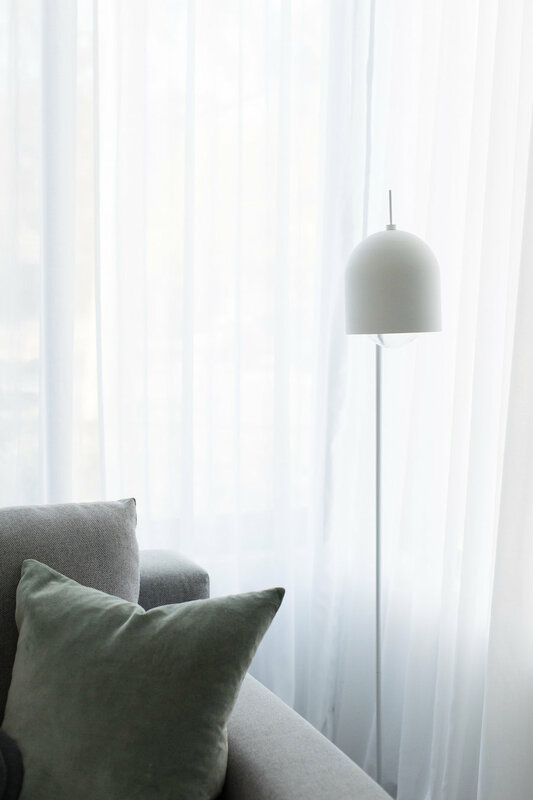 This sleek white metal floor lamp is from Interior Secrets and I couldn’t be happier with it. Behind the sofa I added a timber ladder to hold magazines and I also updated some of the cushions to suit the cooler weather. I still have quite a bit to do in here but I’m so happy with the changes that I’ve already made. I can safely say it was worth the time to create a mood board to guide me as I haven’t bought anything that I’ve regretted! 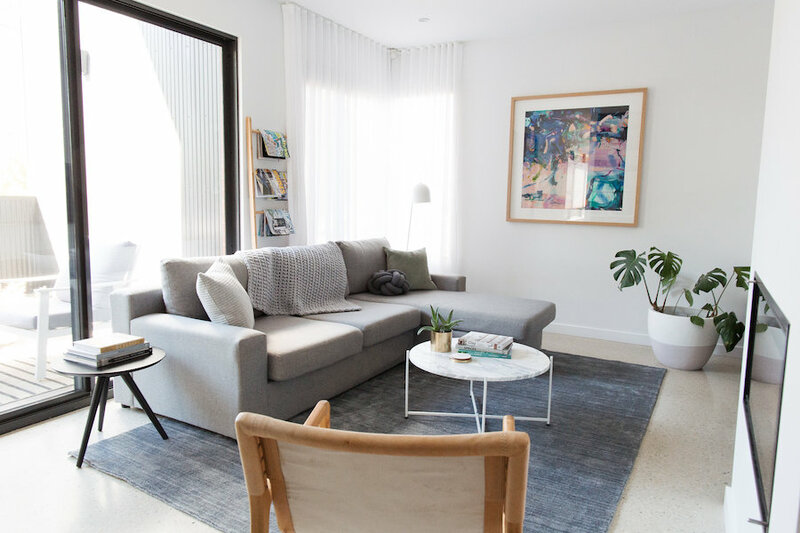 My new BoConcept sofa should be arriving in 3-4 weeks and I CANNOT WAIT to see how it looks in here. It’s a bit bigger than the sofa I currently own and I think the black legs will tie in so well with the joinery in here and the new black side table. I’ve also got some new cushions arriving, including a dreamy soft pink goat fur cushion from Matt Blatt. I’ve also made quite a few changes in the book shelf and have a stack of new decor arriving soon (including some quirky pieces like this goldfish and more classic pieces like this candle holder) so I’m excited to place them in here and show you my finished living room makeover next month! Have you recently seen any pieces that you think would suit my living room? I’d love you to tell me in the comments below. Disclaimer: some products mentioned were gifted. 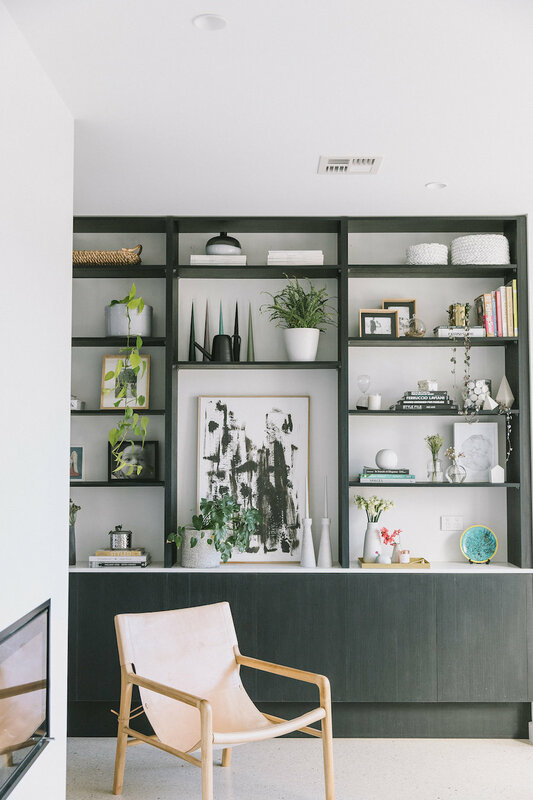 Love this space. Looks great. What is the name of the artwork?